I’ve tried a host of planners and organizational systems. Every one of them has its pros and cons but hands down, a bullet journal has been my all-time favorite and most effective system. Bullet journaling was created by a New York-based designer named Ryder Carroll. It’s a new twist on journal writing. The goal of bullet journaling was to plan future events, keep track of things that happened in the past and organize things in the present. This type of journal is really a combination of planning, journal writing, to-do lists, and tracking important events in your calendar. It’s a type of planner that is completely your own. The thing I really love about bullet journals is that you aren’t held to some strict day, week, month, outline like most conventional planners. It helps you achieve your goals by providing a simplified and focused view. 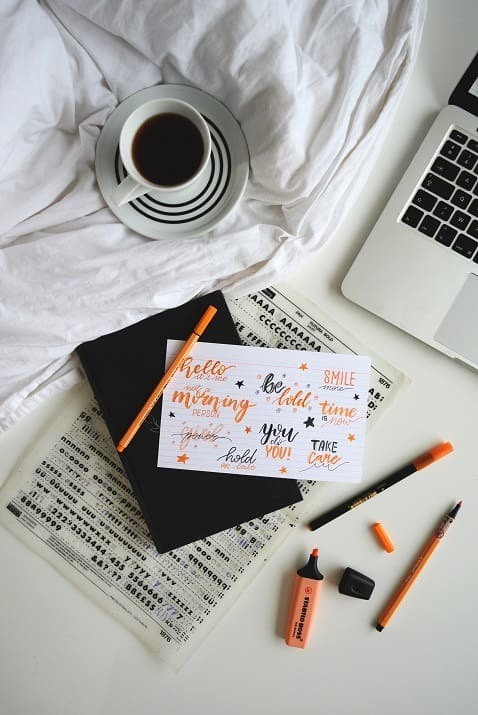 The bullet journal is ideal not just for someone who loves using a planner, but also anyone who wants the benefits of a journal, but doesn’t enjoy writing. Everything is done in a rapid logging method, reducing how much writing is actually done in the journal. In this article, you’ll learn what bullet journaling is, how to effectively use it, and learn how to make the most out of the technique. Bullet journaling may take some work to adjust to, but I believe it’s absolutely worth it. I'll admit, I may have gotten a little carried away with this post. It started out as a guide on how to bullet journal as a college student but I realize now that it really applies to anyone. Nevertheless, you'll see many sections of this guide focused specifically on college students as this type of journaling/planning can be incredibly helpful while in school. This guide is written specifically to learn how to bullet journal so if you're already a seasoned pro you may not learn to much here. Use the table of contents below to navigate to the sections you need help with. I recommend bookmarking this page of pinning it on Pinterest so you can come back to it when you have questions. You really don't need much to start a bullet journal, just a good notebook, some pens, and maybe stickers or washi tape if you feel like decorating your journal. Below we'll go through some of my favorite bullet journaling supplies for college students and anyone else. The basis of the bullet journal system of course is the journal itself. There are so many options out there from ones that already have some formatting to them to journals that are just blank pages. While everyone has their own preference, after testing out several different kinds I've found that I like the dot-grid paper. It helps give some structure to the page and makes it super easy to draw grids and charts (which I use constantly) to measure everything. Pro Tip: There's one journal I recommend to everyone. If you want to skip 30 minutes of reading Amazon reviews trying to pick one, just buy this one, then skip down to the next section. After using multiple journals and checking out other journals friends have used, these are my top three recommendations. Any one of these notebooks should work wonderfully for you. You really just want something simple and unstructured so you can turn this journal into something that is completely you. I've seen many bullet journals that just use a black pen throughout their journal While that may work well for some people, I like to color coordinate my bullet journal. I feel like it becomes more personalized and it's also much easier to recognize what things are. For example, I typically use green on everything that is work related and blue for everything that applies to my personal life. No matter what you do, you'll want to invest in a decent pen that won't bleed through the pages but will still write smooth. This set of simple felt tip pens come in three different thicknesses; .25mm, .35mm, and .45mm. They won't bleed through your pages and will last you a long, long time. If you would like to use a variety of colors throughout your bullet journal (which is what I do) then this pack of pens is my go to option. It's affordable and filled with plenty of colors. I've had mine for months and haven't needed to replace any of the colors yet. While neither of these are required, I definitely like decorating my bullet journal with them. I'm not the most artistic person so they definitely help make the journal my own. While they do serve as decoration, they also serve a functional purpose. Stickers can be used to cover up mistakes in your journal. Like when you misspell a word. And Washi tape can be used to mark your frequently used pages like your monthly spread or habit tracker. One last thing you may want to consider purchasing if you don't already have one is a simple ruler. I really like my lines to be perfectly straight and there's no way I can do that freehand. So I keep a little 6 inch ruler around for when I need to draw lines. Now that you have your bullet journaling supplies it's time to get started. 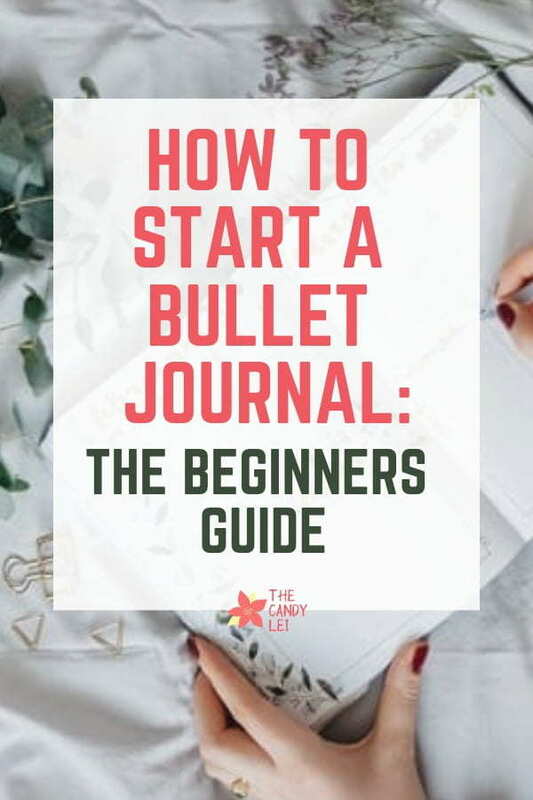 But before we dive into the mechanics, it helps to first understand a little more about what a bullet journal is, how it works, and how it can be useful for you. The most important thing to remember as you set up your bullet journal is to do what works for you. You can absolutely get inspiration from other people (I'll share a few ideas later on) but focus on finding systems that work best for you. 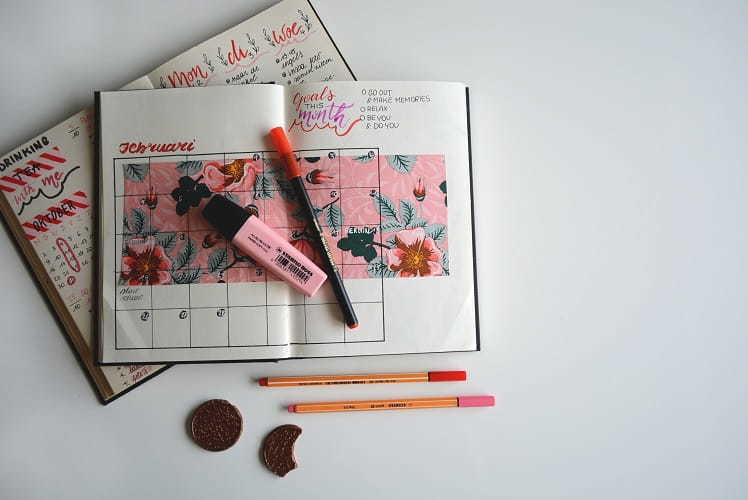 A bullet journal is a combination of calendar, planner, and journal. It makes it easy to keep track of your goals, help you organize your current events and activities, and make plans for the future. In the paragraphs below, you will learn everything there is to know about a setting up a bullet journal. There are several sections that make up the core of a bullet journal. Each of these sections plays a vital role in an effective bullet journal. The first page of your bullet journal is the index. This works much like the index in a book, letting you know what page number each of the following sections is located on. You'll want the index on the first two open pages of your bullet journal. This makes it is easy to find and gives you enough space for everything you'll add to your journal. When I first started using a bullet journal I had a tendency to forget about updating the index. This came to be a problem when I needed to find some notes and I had no idea what page I put them on. Even though it can feel a bit annoying, make sure you update your index every time you add more pages to your journal. A bullet journal key can also be added to the beginning of the journal. If you are going to use different styles of bullets for tasks, events, appointments, deadlines, cancelled events/appointments, etc. While a key isn't necessary it can be helpful when you first start using the bullet journal system. The future log is the next section in your bullet journal. It makes it easy to record upcoming appointments, events, and birthdays for the months you haven't set up yet. This would be a page where you record that date for that dentist appointment 3 months from now for example. People typically set up the future log to cover 3, 6, or 12 months. Personally I go with six months. It's plenty of time to record important upcoming events. When I have tried 12 months those second 6 months don't get used for a long time. Here's how I set up my future log. Use the next two pages after the index. Then write Future Log at the top of them. Divide each page into three even horizontal sections. Each section is a month in your six-month Future Log. Enter the name of six consecutive months at the top of each of the sections. Then, add the page numbers to the bottom of the page and record them on your index. Lastly, write down any major events or appointments you need to remember on your log. The monthly log is a big part of a bullet journal. It's an easy way to get a big picture of your month and the major events occurring during it. One common way to set this up is in a list format. To do this you can start at the top of your page and give each new line a date of the month. If you'd like, you can also include a letter indicating the day of the week (i.e. M, T, W, etc). Another way to set this up is in the traditional calendar format. You can spread it across one or two pages depending on how much room you think you need. Personally, I like the list format. While it doesn't look like a traditional calendar it's easy to navigate and doesn't take up quite as much space. Plus it's faster to set up. Once you've set up this page don't forget to add it to your index. Your about halfway through this article and maybe you've decided a bullet journal isn't for you. Well, check out our comparison of the Passion planner vs Panda planner for two other fantastic planner options. In addition to the monthly calendar, another useful tool is the monthly task list or to-do list. This is a simple way to take note of everything you'd like to accomplish this month. I recommend setting this up right next to your monthly log. I recommend starting the list with the most important tasks and moving your way down in priority. You can also use different colored pens to distinguish between work tasks and personal tasks. As you complete each task you'll come back to this page and cross it off. What I love about this is it gives me an immediate picture of what I've accomplished during the previous month. It's so easy to lose sight of what you have actually achieved over a given month but with this task list I get a much deeper sense of how much I've truly done. As we continue the breakdown, the next section is the weekly calendar log. 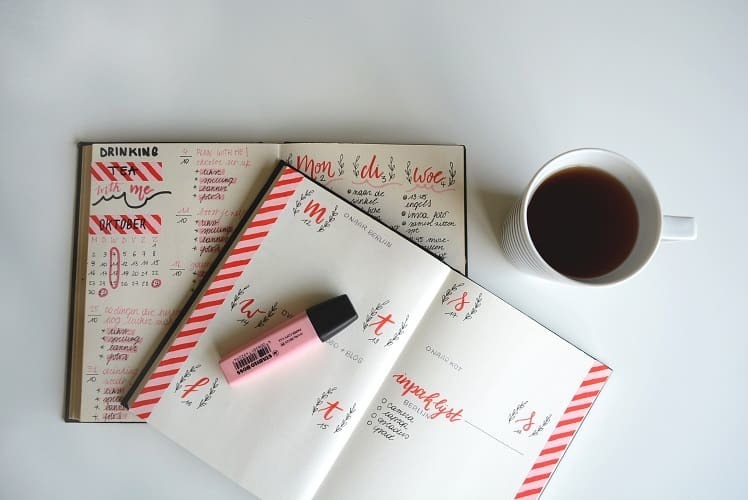 This is much like a traditional planner where you can write down the tasks you need to complete for the day, the appointments or meetings you have, and any other special events. Many people skip weeklies and put everything they have on dailies. That's the approach I take too. It seems a bit overkill to include a monthly, weekly, and daily log. But there is no right or wrong way to do this so do what ever works best for you. The daily log is where a bulk of the work gets done in your bullet journal. It's here that you can record any appointments and meetings you had. You can even use your dailies to record important notes from classes or meetings. In college I also used my daily to record a food log. I just included three lines at the bottom, one for breakfast, lunch, and dinner. There are many ways to set up your dailies but I prefer the horizontal method, though that's only when my daily doesn't take up a whole page. I actually set up each day separately. So each morning as I prepare for the day I mark off the day before and start fresh for the day. I simply fill the space with anything I need to over the course of the day and then the next morning I box off the previous day and start again. That sounds confusing but basically what I'm saying is don't feel like you need to Realize that some days you'll need more space than others. Another aspect of dailies and bullet journals in general that we haven't talked about and that's the actual bullets. You can use different styles of bullets to help distinguish between tasks, notes, and appointments. For example, Tasks will be bulleted by an open circle; appointments by a star and notes with a dash. Obviously, you are free to use any type of bullet that helps you keep your journal in order. If a task is very important, you should add some type of marker to it, such as an asterisk. This is just a quick reminder that the item needs specific attention. These special bullets are known as 'signifiers', since they help add priority to a bullet. Collections are essentially "everything else" you'd like to keep track of in your journal. This can be everything from class notes, gym workouts, books you've read, meal plans, etc. We'll walk through a few of these and more below. To set up a collection just flip to the page you'd like to use and write down a title at the top describing what the collection is about. One thing I like to do with my collections is add them in at the back of the book. This way they don't get mixed in with all of my monthly and daily sections. Each time I want to add another collection I just move one page forward from the back. You'll absolutely want to add collections to your index as you can quickly forget what page they are one. Hopefully you aren't too confused after reading through all of that. I know it's a ton of info. But this section should really help bring it all together. 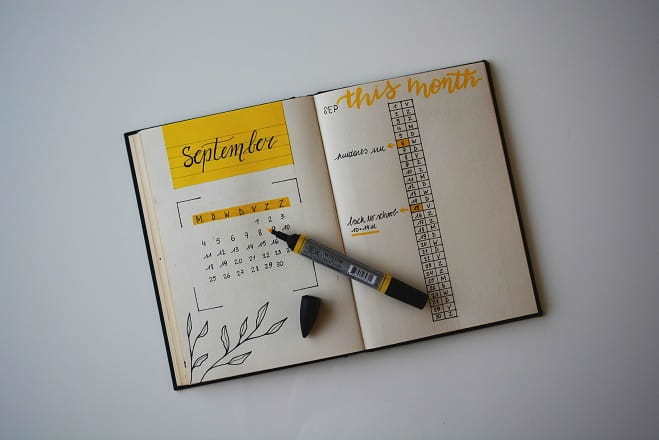 At the end of a month, create the pages for the next monthly log just like you did when you first set up your journal. Go through the ending month's daily log and review all of your tasks. If you haven't already, be sure to cross out the items that you've completed. For the tasks that are remaining you'll need to decide where you want to migrate them. Here's what I do for my journal. If I want to move a task to the next month I turn the bullet into a green, right arrow. Then I copy the text over to the next months log. If the tasks doesn't need to be completed the next month (or I know I won't have time) I turn the bullet into a red, left pointing arrow. Then I add the sentence to the future log on the month I'd like to complete it in. 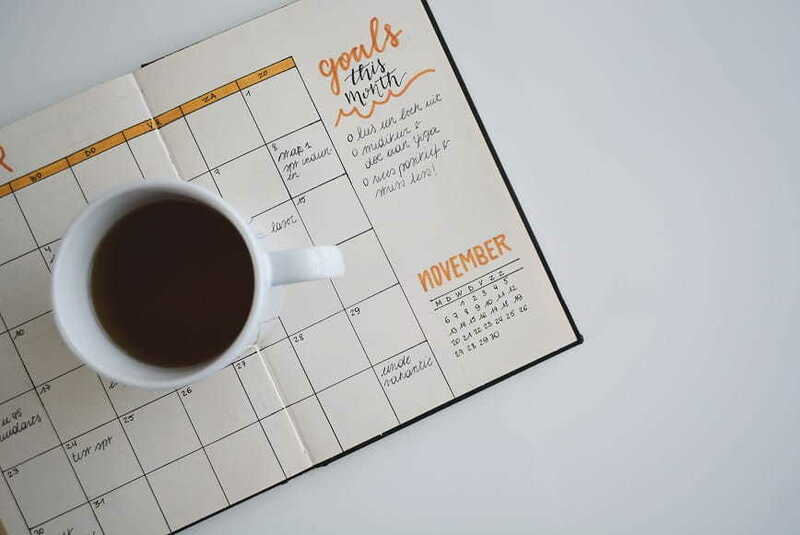 During this process I also review my future log and if there are any important appointments or tasks that I recorded there, I'll add them to my monthly log or task list. As mentioned, collections are basically everything else you add to your bullet journal. Whether it's a grocery list or a doodle, it falls into the collection category. Below are some of the collections I've used regularly in my journals along with a few others I want to try. 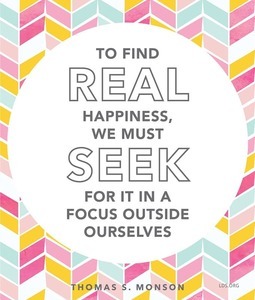 There's a popular TED talk by Shawn Achor about the secret to happy work. It's an awesome talk. Actually, it's so good I'm just embedding it below. When you have a minute, watch it. But at the end he talks about how vital gratitude is to a happy life. My own experience has proven the same. When I keep a gratitude journal I feel better about my life. Every day I write down 2-3 things I'm grateful for during the day. Bonus: Shawn actually has a book, The Happiness Advantage, that is phenomenal. Seriously, if you're striving to live happier no matter your circumstance I recommend reading this book. Planning my meals has always been a struggle for me. Using a basic meal plan collection is one way to simplify things, espcially in college. I ate terribly while I was in school and wish I had used a meal plan. For my meal plans I record a handful of dishes I'd like to cook over the course of the month. Sometimes I'll theme the entire month, like January was vegetarian month. Then my meal plan had 8 different vegetarian meals. I always cook enough that I can eat something for dinner and then for lunch the next day. It saves time and as a result I definitely eat a bit healthier. While I tend to include a list of monthly goals next to my Monthly task list, I also like to keep larger, long term goals in a collection. These are goals that may take me months or even years to accomplish. I look at this page regularly to remind me what I'm trying to accomplish. While I don't do this myself, I have seen some people who also include a reward for accomplishing a given goal. Another collection I've used is to track my spending. When I was in college I definitely felt like the money I did earn with my part time job just slipped through my fingers. Now, every time I spend money, whether it's paying a bill online or grabbing lunch somewhere, I pop open my bullet journal and record how much I spent and where I spent it. Then at the end of each week I total how much i spent and compare it to my bank account to make sure they match up. This little practice has definitely helped me reign in my spending habits. Many, many collections can be made up of lists. I have collections that are just lists of my favorite movies, songs that boost my mood, grocery staples (the stuff I buy every week), famous people I want to meet, qualities I'm looking for in a spouse, etc. I love making lists. I've found it helps me organize my thoughts. Similar to lists, brainstorming sessions can make up great collections. I have brainstorming sessions all the time to help grow my web business, how to get healthier, and gifts I can give my boyfriend. Brainstorming sessions can help you come up with new ideas. And the beauty of them being in your bullet journal is you can come back to them again and again to add new thoughts and ideas. Finding the bullet journal system has been a huge blessing for me. My life has become far more organized since I began using a bullet journal. One important thing to remember about your bullet journal is to make it yours. Whether or not you're artistic, turn your bullet journal into something you love to use. Decorate it any way you like and above all, continually experiment with it. I'll be honest, the first time though you probably won't get it right. You might not even like using it. But if you'll stick with it and continue to test out new ways to lay out the information you'll eventually find a system that works for you. And then you too will love using your bullet journal. If you do too then you'll love our monthly email. 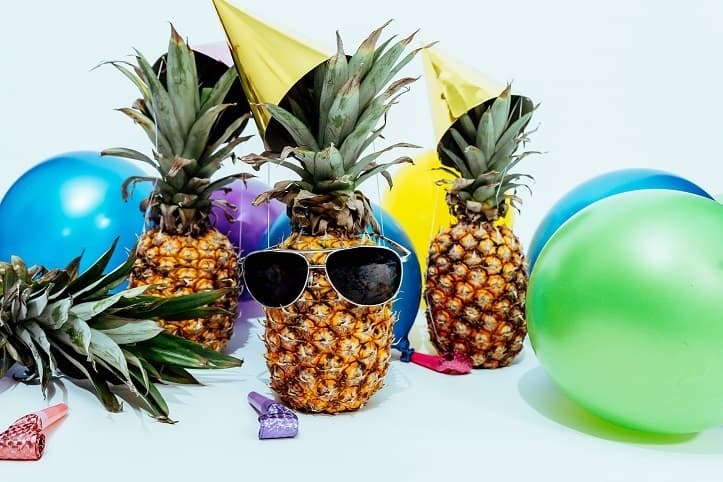 Loaded with seasonal party tips, tricks, and DIY's. The Candy Lei is a participant in the Amazon Services LLC Associates Program, an affiliate advertising program designed to provide a means for sites to earn advertising fees by advertising and linking to amazon.com. We are also member of other affiliate programs whose links may be on this page.